While arthroscopic complete repair of massive rotator cuff tears (MRCT) back to their anatomic footprint is preferential, there are cases where this type of repair is not applicable due to the contraction of the torn tendons. In such cases, a non-anatomic incomplete or partial repair can be performed. A number of clinical studies have investigated the clinical and functional outcomes of arthroscopic partial repair for irreparable MRCT. To our knowledge, no systematic review has been published yet to synthetically evaluate these results. Two reviewers independently conducted the search in a PRISMA-compliant systematic way using the MEDLINE/PubMed database and the Cochrane Database of Systematic Reviews. These databases were queried with the terms “arthroscopy”[MeSH Terms] OR arthroscopic surgical procedure [Text Word (tw)] AND massive rotator cuff tears [tw] AND arthroscopic partial repair [tw]. From the 55 initial studies, we finally chose 11 clinical studies which were eligible to our inclusion-exclusion criteria. The mean modified methodology Coleman score was 58/100, whereas it ranged from 41/100 to 78/100. In total, 643 patients were included in this review. All postoperative mean clinical and functional subjective scores, as well as muscle strength of patients treated with arthroscopic partial repair, were found significantly improved, when compared with the respective mean preoperative values. The rate of structural failure of the partial repair, as it was estimated by postoperative imaging modalities, was 48.9%. The overall reoperations’ rate was 2.9% regarding the patients who were treated with partial repair. Arthroscopic partial repair might be a safe and effective alternative treatment for irreparable contracted MRCT, where a complete repair cannot be performed. The methodological quality of the relevant, available literature is low to moderate; therefore, further studies of higher quality are required to confirm these results. Arthroscopic partial repair might be a safe and effective salvage solution in cases where an arthroscopic complete repair of massive rotator cuff tears cannot be performed. The methodological quality of the relevant, available literature is low to moderate; therefore, further studies of higher quality are required to confirm our results. The understanding of rotator cuff pathology and healing continues to evolve, beginning with emerging descriptions of the anatomic footprint and natural history of rotator cuff tears . Shoulder anatomy, pathology, and biomechanics place unique stress on the rotator cuff tendons during sports activity , whereas smoking, hypercholesterolemia, and genetics have all been shown to influence the development of rotator cuff tearing . Depending on the degree of cuff pathology, acromioplasty, debridement of partial cuff tears, and repair of full-thickness tears are usually successful in those who fail a rehabilitation program . Complete repair, if possible, is the optimal treatment for full-thickness rotator cuff tears . On the other hand, the management of massive, irreparable rotator cuff tears (MRCT) is challenging and associated with high failure rates, since there are no current consensus or definitive guidelines concerning the optimal surgical treatment for this devastating condition . Arthroscopic options include rotator cuff repair, partial cuff repairs, tendon allografts or xenografts, decompression, débridement, biceps tenotomy, tenodesis, and tendon transfers . The treatment modality specifically chosen for the massive, irreparable rotator cuff tear must be tailored to the individual patient, their needs and expectations, and their ability to comply with intensive rehabilitation . While arthroscopic complete repair of MRCT back to their anatomic footprint is preferential, there are cases where this type of repair is not applicable due to the contraction of the torn tendons. In such cases, a non-anatomic incomplete or partial repair can be performed. Arthroscopic partial repair is indicated for young patients when the muscle is still trophic with a fatty infiltration less than 3, according to the MRI-based Fuchs classification . It can be combined with a tendon transfer like latissimus dorsi (or alternatively lower trapezius) in irreparable posterosuperior tears or pectoralis major (or alternatively latissimus dorsi) in anterosuperior cuff tears . A number of clinical studies have investigated the clinical and functional outcomes of arthroscopic partial repair for irreparable MRCT [11, 12, 13, 14, 15, 16, 17, 18, 19, 20, 21]. To our knowledge, no systematic review has been published yet to synthetically evaluate these results. Our aims were twofold: (1) to summarize failure rates and clinical/functional/radiographic outcomes associated with the arthroscopic partial repair as the method of treatment for symptomatic irreparable MRCT and (2) to characterize the methodological quality of the relevant, available literature. Our hypothesis was that arthroscopic partial repair would be proven a safe and effective treatment for this type of lesions where no complete repair can be done. Two reviewers (MAM, LK) independently conducted the search in a systematic way according to the Preferred Reporting Items for Systematic Reviews and Meta-Analyses (PRISMA) using the MEDLINE/PubMed database and the Cochrane Database of Systematic Reviews. These databases were searched using the terms “arthroscopy”[MeSH Terms] OR arthroscopic surgical procedure [Text Word (tw)] AND massive rotator cuff tears [tw] AND arthroscopic partial repair [tw]. To maximize the search, backward chaining of reference lists from retrieved papers was also undertaken. A preliminary assessment of only the titles and abstracts of the search results was initially performed. The second stage involved a careful review of the full-text publications. 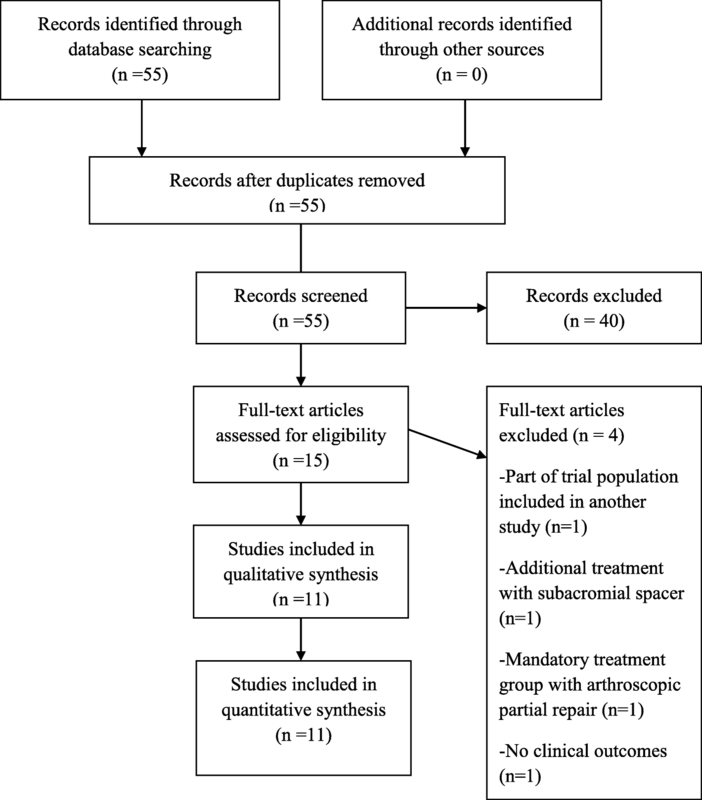 Inclusion criteria were clinical studies investigating adult patients, diagnosed with symptomatic MRCT, who were treated with arthroscopic partial repair, and who had a minimum of 12 months clinical follow-up (with clinical tests and/or scores). These studies should have been written in English or German as full-text articles and they should have been published by March 1, 2018 (end of our search). We excluded from our review all studies which were not dealing with partial repair (other means of operative or nonoperative treatment), non-arthroscopic procedures (open or mini-open), studies about reparable massive or non-massive RCT, trials with follow-up less than 12 months, studies without clinical/functional outcome variables, abstracts, editorial comments, case reports, corrigenda, technical notes, literature reviews, preclinical studies, and papers not written in English or German. Differences between reviewers were discussed until agreement was achieved. In cases of disagreement, the senior author (EA) had the final decision. The two reviewers independently extracted data from each study and assessed variable reporting of outcome data. Descriptive statistics were calculated for each study and parameters analyzed. The “quality assessment” of the studies for methodological deficiencies, as a common alternative to “risk of bias” , was examined by the modified Coleman methodology score . The methodological quality of each study and the different types of detected bias were assessed independently by each reviewer and then they were combined synthetically. Selective reporting bias like publication bias was not included in the assessment. The primary outcome measure was the failure rate leading to reoperation and the clinical, functional, and radiographic outcomes. The secondary outcome was the quality assessment of the studies with the use of the modified Coleman methodology score. From the 55 initial studies, we finally chose and assessed 11 clinical studies which were eligible to our inclusion-exclusion criteria [11, 12, 13, 14, 15, 16, 17, 18, 19, 20, 21]. We excluded all the irrelevant studies (16), technical notes (6), trials not referring to massive rotator cuff tears (5), reviews of the literature (4) (not relevant to our review), papers concerning only full repair (4), mini-open procedures (2), studies dealing with massive rotator cuff tears treated with subacromial biodegradable spacers (2) or greater tuberoplasty (1), trials regarding pigmented villonodular synovitis (1), case reports (1), papers without any clinical outcome (1), and papers written in Chinese (1). A summary flowchart of our literature search according to PRISMA guidelines can be found in Fig. 1. All studies included in this review were published between 2010 and 2016 [11, 12, 13, 14, 15, 16, 17, 18, 19, 20, 21] (Table 1). Six out of the 11 studies of this review (54.5%) had a level of evidence III [13, 14, 15, 16, 17, 19], while three studies (27.3%) had a level of evidence IV [12, 18, 21], one study (9.1%) a level of evidence I , and another one (9.1%) a level of evidence II  (Table 2). We found eight comparative studies (72.7%) [11, 13, 14, 15, 16, 17, 19, 20] and three non-comparative studies (27.3%) [12, 18, 21], whereas only one trial (9.1%)  was randomized and ten trials (90.9%) were non-randomized [12, 13, 14, 15, 16, 17, 18, 19, 20]. The most common comparisons were between arthroscopic complete repair and partial repair [14, 15, 16, 17] as well as arthroscopic partial repair and debridement [11, 13, 15]. One study compared the arthroscopic partial repair technique with latissimus dorsi transfer  and another one with a patch autograft procedure  (Table 1). The mean modified methodology Coleman score for methodological deficiencies of the studies was 58/100, whereas it ranged from 41/100  to 78/100  (Table 2). All studies of this review (100%) were characterized by a possible high risk of performance bias [11, 12, 13, 14, 15, 16, 17, 18, 19, 20, 21], while nine studies (81.8%) were found with possible selection bias [11, 13, 14, 15, 16, 17, 19, 20, 21], six studies (54.5%) with possible detection bias [11, 12, 13, 16, 19, 20], and five studies (45.5%) with possible attrition bias [12, 14, 17, 18, 19] (Table 2). Totally, 643 patients were included in this review. From them, 348 patients were treated with an arthroscopic partial repair procedure, while 295 patients underwent another type of treatment (either as control or as study groups). The majority of the patients who were treated with the arthroscopic partial repair technique were males (63.7%). The mean age of the patients who underwent arthroscopic partial repair ranged from 59.4 years  to 68 years , while the mean age of the patients who were treated with other operative techniques ranged from 62.5 years  to 66.5 years . The mean follow-up of the patients who underwent arthroscopic partial repair ranged between 16  and 93.6 months , whereas the mean follow-up of the patients who were treated with other operative techniques ranged from 24 months [11, 16, 17] to 93.6 months  (Table 3). The overall reoperation rate was 2.9% for patients who were treated with partial repair. The most common reason for reoperation was severe glenohumeral osteoarthritis (1.1%) and the second most common reason was failure of the repair and persistent pain (0.9%). The most common type of reoperation was reverse shoulder arthroplasty (1.1%) (Table 4). In cases of massive rotator cuff rupture, early and mid-term results of partial repair were slightly superior to those of arthroscopic debridement alone. The treatment of massive rotator cuff tears with partial arthroscopic rotator cuff repair and biceps tenotomy results in midterm subjective satisfaction in the majority of patients. In the surgical treatment of irreparable rotator cuff tears, arthroscopic debridement associated \with acromioplasty and bursectomy and partial repair of rotator cuff tear are both effective in reducing symptoms, with the latter also offering higher functional outcomes. The repair of massive rotator cuff tears with partial or complete repair results in equivalent Constant scores improvement. Arthroscopic debridement, partial rotator cuff repair, and complete rotator cuff repair are effective in treating massive rotator cuff tears. Complete rotator cuff repair shows better short-term results. The partial repair of massive rotator cuff tears showed a statistically significant improvement in ROM, strength and disability scores. However, the results were slightly inferior compared to complete repair. Partial repair of massive rotator cuff tears yields comparable short-term results to complete repair. In the arthroscopic treatment of irreparable massive rotator cuff tears with low-grade fatty infiltration of infraspinatus, the patch graft showed a lower retear rate (8.3%) than partial repair (41.7%). A: A rupture of the latissimus dorsi tendon was recorded 13 months postoperatively. A reverse total shoulder arthroplasty was performed. In irreparable rotator cuff tears, arthroscopic-assisted latissimus dorsi tendon transfer and arthroscopic rotator cuff partial repair are both effective ways to treat patients’ symptoms. In younger patients, the first option offers better clinical results. Arthroscopic partial repair of irreparable massive rotator cuff tears may produce short-term improvement. Fatty infiltration of the teres minor was the identified factor that affected patient-rated satisfaction. Range of motion (ROM) was measured in eight studies (72.7%) [11, 12, 13, 15, 16, 19, 20, 21], muscle strength in six studies (54.5%) [11, 14, 16, 19, 20, 21], and patients’ satisfaction in two studies (18.2%) [15, 21]. The Constant score was used in six (54.5%) of the studies which were included in this review [11, 14, 15, 16, 18, 19], whereas the visual analogue scale (VAS) in five studies (45.5%) [12, 15, 19, 20, 21] as well as The University of California at Los Angeles (UCLA) Shoulder Score (45.5%) [13, 17, 18, 19, 20]. From the rest of the outcome variables, the most commonly used was the American Shoulder and Elbow Surgeons (ASES) score, with a 36.4% rate amongst studies [12, 16, 19, 21], whereas the Disabilities of the Arm, Shoulder and Hand (DASH) Score, subjective shoulder value (SSV), simple shoulder test (SST), and Rotator Cuff Quality of Life (RC-QOL) score were utilized equally in 18.2% [11, 15], 18.2% [14, 15], 18.2% [12, 21], and 18.2% [13, 20], respectively. Finally, the short Western Ontario Rotator Cuff Index was used in one study (9.1%)  (Table 3). 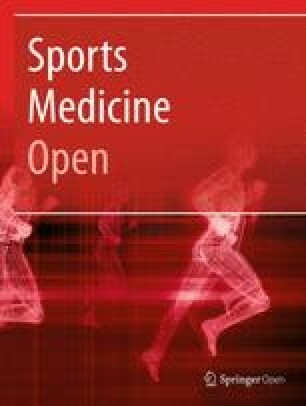 All postoperative mean clinical and functional subjective scores, as well as muscle strength of patients treated with arthroscopic partial repair, were found significantly improved, when compared with the respective mean preoperative values in all 11 studies which were included in this review [11, 12, 13, 14, 15, 16, 17, 18, 19, 20, 21]. Ten out of 11 studies (90.9%) documented significant postoperative improvement in the ROM of the arthroscopic partial repair-treated patients [11, 13, 14, 15, 16, 17, 18, 19, 20, 21], while one study (9.1%)  did not illustrate any significant improvement in comparison with the preoperative ROM. In the two studies which evaluated patients’ satisfaction, Heuberer et al. illustrated high postoperative patients’ satisfaction (86%) with the use of partial repair (no significant difference in comparison with the complete repair group as well as the debridement group), whereas Shon et al. showed that only half of the treated patients declared themselves satisfied [15, 21]. The specific preoperative and postoperative mean values of the clinical and functional outcome variables per study can be found in Table 4. Four studies of this review (36.4%) assessed the postoperative re-tear rate of the partial repair [11, 14, 15, 19]. Three of these studies (28.2% of all studies) used diagnostic ultrasonography for their postoperative imaging evaluation [11, 14, 15], while two studies (18.2%) made use of the MRI [15, 19]. Overall, the rate of structural failure of the partial repair was 48.9% amongst these studies [11, 14, 15, 19]. Two studies (18.2%) [12, 21] reported the postoperative radiographic progression of osteoarthritis according to Hamada score . According to Shon et al., all patients included in their study were found without any changes in the Hamada score at their final follow-up X-ray when it was compared with the initial preoperative score . On the contrary, 36% of the patients (10 out of 28 patients) who were followed in the study of Cuff et al. had postoperative osteoarthritic progression of one or more Hamada stages  (Table 3). Kim et al. found a small but statistically significant postoperative decrease in the acromiohumeral distance in comparison with the mean preoperative value (from a preoperative mean value of 6.5 mm to a postoperative mean value of 5.9 mm; p < 0.001) . However, according to Kim et al., this difference was not clinically significant  (Table 3). The most important finding of this review was that all those studies which evaluated arthroscopic partial repair for the treatment of irreparable MRCT documented significant improvements in all postoperative subjective clinical and functional scores which were measured. All studies showed significant improvement of postoperative muscle strength and almost all of them reported significant improvement in the ROM at the last follow-up assessment. It seems that the rebalanced remaining anterior and posterior parts of the rotator cuff recover shoulder stability, which subsequently allows better function and decreased pain even after a partial non-anatomic repair . In addition, the complication and reoperation rates in our review were found to be very low. Clinical symptoms like persistent pain due to failure of the repair were rather uncommon and only rarely led to a revision surgery. According to these results, arthroscopic partial repair can be chosen as a safe and effective salvage solution in cases where an arthroscopic complete repair cannot be performed. This means that arthroscopic partial repair does not substitute complete anatomic repair, which remains the treatment of choice in cases where the retracted torn tendons can be repaired back to their anatomic footprint. On the other hand, the re-tear rate of the repair, as estimated by postoperative MRI or ultrasound, was found to be almost 50%. This very high rate of structural failure of the arthroscopic partial repair raises serious concerns regarding the actual value of this treatment. Notwithstanding, the clinical relevance of this finding remains controversial as many patients continue to improve, not only clinically but also functionally (ROM and strength), even when the integrity of the repair has deteriorated. According to Lubiatowski et al., rotator cuff integrity after arthroscopic repair does not seem to affect clinical scores . A possible explanation might be that the reduction of pain-related muscle activity inhibition via arthroscopic debridement, lavage, and intra-articular synovectomy could lead to increased shoulder muscle strength regardless of the success of the repair [11, 27]. Moreover, a possible complete or partial decompression of a tethered suprascapular nerve during the arthroscopic procedure might also contribute to the symptomatic relief of the patient, independently of the longevity of the repair . Kim et al. illustrated that there was a significant decrease in the acromiohumeral distance after surgery . Nevertheless, the importance of this X-ray finding in relation to a possible development of rotator cuff arthropathy has yet to be determined in future studies. While Kim et al. reported no osteoarthritic changes (Hamada score) in any of their patients , Shon et al. showed that more than one third of their patients had deteriorated radiographic outcomes . Long-term studies are considered necessary to show whether arthroscopic partial repair results in progression of glenohumeral osteoarthritis or not. The total number of patients who were treated with arthroscopic partial repair was rather small to extract definite conclusions. In addition, the follow-up varied widely amongst studies, from 2 to 8 years, and no studies reported long-term follow-up. Considering that this is an operative procedure with only short- to mid-term results documented, new studies investigating the long-term outcome of arthroscopic partial repair are required to confirm the therapeutic value of this technique. The overall quality of the studies was not high and was rated as moderate according to the mean modified Coleman methodology score. Most studies included were characterized by high risk of various potential bias, especially performance and selection bias. In addition, a relative lack of well-designed prospective trials was noted, since there was only one randomized controlled trial  and almost all other studies were of level III or IV. Other drawbacks were that some studies assessed heterogeneous populations with significantly different baseline characteristics amongst groups, including patients with different grades of fatty infiltration, size and types of lesions, and number and type of torn tendons. Finally, even the type of the operative procedure which was described as arthroscopic partial repair was not exactly the same. Some physicians performed a medialized repair that allowed for a tension-free repair , whereas some other authors used the typical partial repair with margin convergence as initially described by Burkhart et al. .
No sources of funding were used to assist in the preparation of this review. M-AM conducted the research protocol, assessed the data of the review independently from the other reviewers, and wrote the manuscript as the main author. LK gathered the data and assessed them independently from the other reviewers. EC critically revised and edited the manuscript. EB assisted in the interpretation of data and critical revision of the manuscript. GA critically revised the manuscript. EA supervised as the senior author of the whole project and revised critically and edited the manuscript. All authors read and approved the final manuscript. Not applicable (Review Article without involving animals, human participants, human data or human tissue). The authors, Michael-Alex, er Malahias, Lazaros Kostretzis, Efstathios Chronopoulos, Emmanouil Brilakis, Gregorios Avramidis, and Emmanouil Antonogiannakis, declare that they have no competing interests.